From a puppy tied to a door knob in 2003 with a sign attached that read "Free Dog" To the most treasured companion of the most fabulous family. Akira found a wonderful life and was a true friend who traveled many training miles with her young owner. She often visited us here to the delight of all and never lost her sweetness and charm. Tonight we all said a sad and painful farewell to the most patient, loyal, courageous girl. Akira was so very SPECIAL! Journey was one of the very lucky ones. This is his loving Family's tribute to him. When you bring a pet into your life, you begin a journey - a journey that will bring you more love and devotion than you have ever known, yet also tests your strength and courage. If you allow, the journey will teach you many things, about life, about yourself, and most of all, about love. You will come away changed forever, for one soul cannot touch another without leaving its mark. Along the way, you will learn much about savouring life's simple pleasures - jumping in leaves, snoozing in the sun, the joys of puddles, and even the satisfaction of a good scratch behind the ears. Too many times we hike on automatic pilot, our goal being to complete the trail rather than enjoy the journey. We miss the details - the colourful mushrooms on the rotting log, the honeycomb in the old maple snag, the hawk feather caught on a twig. Once we walk as a dog does, we discover a whole new world. We stop; we browse the landscape, we kick over leaves, peek in tree holes, look up, down, all around. And we learn what any dog knows: that nature has created a marvellously complex world that is full of surprises, that each cycle of the seasons bring ever changing wonders, each day a wonderful essence all its very own. I must caution you that this journey is not without pain. Like all paths of true love, the pain is part of loving. For as surely as the sun sets, one day your dear animal companion will follow a trail you cannot yet go down. And you will have to find the strength and love to let them go. A pet's time on earth is far too short, especially for those that love them. We borrow them, really, just for a while, and during these brief years they are generous enough to give us all their love, every inch of their spirit and heart, until one day there is nothing left. The cat that only yesterday was a kitten is all too soon old and frail and sleeping in the sun. The young pup of boundless energy wakes up stiff and lame, the muzzle now grey. Deep down we somehow always knew that this journey would end. We knew that if we gave our hearts they would be broken. But give them we must for it is all they ask in return. When the time comes, and the road curves ahead to a place we cannot see, we give one final gift and let them run on ahead - young, whole and once more free. "Godspeed, good friend," we say, until our journey comes full circle and our paths cross again somewhere North of the peaceful Rainbow Bridge. Harley seemed good-natured enough, however we strongly suspect a past of violent abuse, part of it done by children. He needs time to trust a handler, for petting, and when he feels at ease, he allows close contact. Like any other dog, his ears display the level of threat he feels. This comes in handy sometimes since he can change behavior rather quickly, depending on how he is handled. 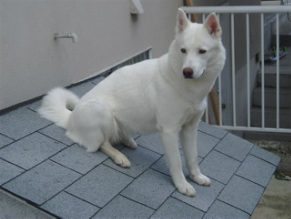 HARLEY: an 18 month old male Husky. Surrendered to the Shelter because the owners did not have enough time to take proper care of him. They also mentionned that he had a tendency to grab the hands of people who took his collar. Harley was apprehensive at first, but he warmed up to the place and the staff. He likes to play with people, but becomes brutal in the yard with a male, and has displayed aggressive dominant behaviors. Harley has grabbed the hands of children through the kennel door, causing them superficial lacerations. Poor Harley, no one ever came for him and his time ran out !! He has peacefully gone to the Rainbow Bridge where he is free, happy and will never be neglected or abused again. It's very sad that people still daily continue to purchase Siberians from Pet Stores and other unreliable sources. Breeders who will not take back the dogs they have sold contribute to the agony of many dogs like Harley. 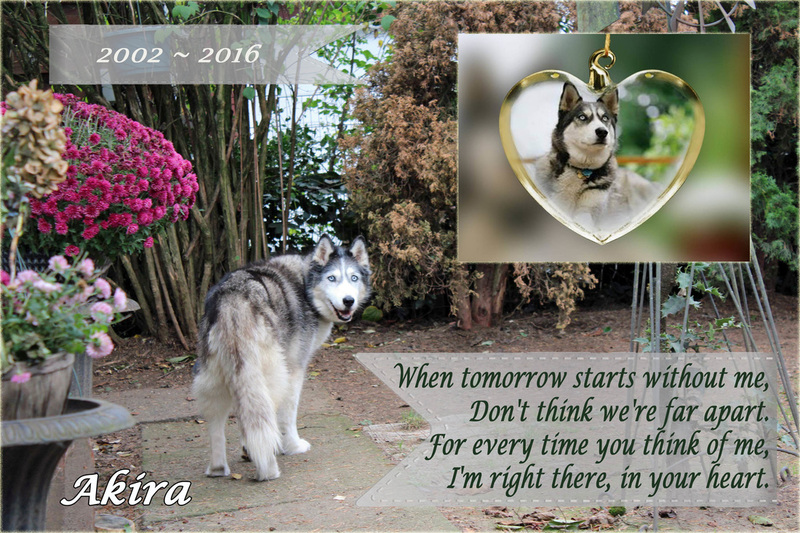 People who get a Siberian without the necessary knowledge or commitment add to the grief of so many of these beautiful dogs. Remember Harley and the fate he suffered. Please save a rescue or a shelter dog from the same tragic end.